Student Services, Lower Ground Floor, Neuadd Rathbone, College Road, Bangor. It can be accessed via College Road or Love Lane. 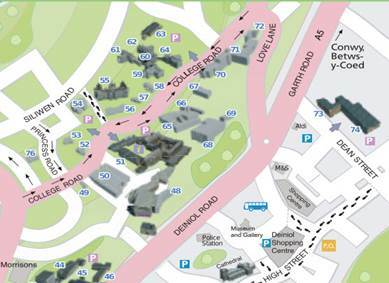 Please see the online location map for Neuadd Rathbone. Using the Lift: go through the automatic glass door at the far left-hand side of Rathbone and follow the corridor to the lift. We are on floor “-1” (that’s the lower ground floor). Out of the lift, follow the corridor through the waiting room and double doors to reception. Follow the footpath at the side of the automatic glass door at the far left-hand side of Rathbone to Disability Services and down the steps and around the building. This takes you to further steps / ramp up to the main entrance. Alternatively you can access entrance 2 through the gates off Love Lane and use the ramp, thereby avoiding steps.